The Daily Calendar displays a single date's class schedule by Instructor and can be accessed using Classes > Search (Day View) or Classes > Weekly / Daily Calendar. It can also be opened by clicking the specific day/date in Weekly Calendar. The Daily Calendar displays by Instructor and by Instructor Skills. 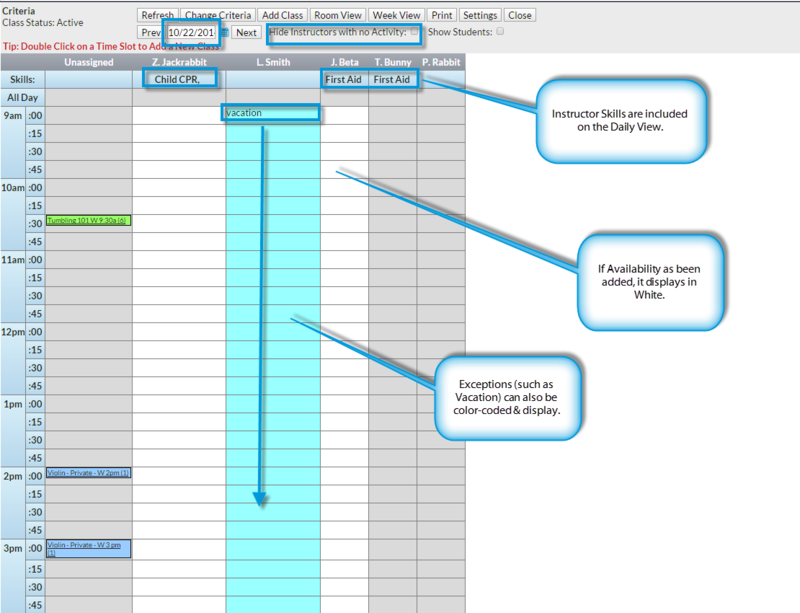 The columns are dynamic and shift left based on which instructor has the most activity. Instructors with the most classes on a specific day will display in the first column. After class count, instructors are then sorted alphabetically by name for display purposes. Instructors with no classes can be hidden by checking the Hide Instructors with no Activity checkbox. Instructor Availability and Exceptions are listed. See the Staff / Instructors topic for details. Almost all of the Weekly Calendar options are also available in the Daily Calendar.